﻿ Press Comments.. What the papers say! Zak Martin ha protagonizado titulares desde adolescente. Dio su primer discurso público en el famoso Buswells Hotel de Dublín a los dieciocho años y su primera demostración de hipnosis y "sexto sentido" un año más tarde. Sus apariciones en escenarios y experimentos públicos (como una partida de ajedrez a larga distancia por telepatía) atrajo la atención de los medios, y en los siguientes años sus predicciones y declaraciones psíquicas fueron publicados en periodicos y revistas de todo el mundo. En Gran Bretaña, Zak Martin ha sido noticia por su trabajo de investigación psíquica con Scotland Yard, su amistad con la princesa Diana, su trabajo como asesor de famosos cantantes y personalidades de la televisión y la fundación del London Psychic Centre y Mayfair Clinic of Holistic Medicine. Ha hecho numerosas apariciones en televisión en países de todo el mundo, incluyendo Gran Bretaña, Estados Unidos y Japón, así como en la mayoría de los países europeos, entre ellos su Irlanda natal. Durante el tiempo en el que vivió en el Reino Unido era un invitado habitual en las dos emisoras de radio principales de Londres, LBC y Capital. Zak Martin wrote How to Develop your ESP while he was still a student at university in Ireland. The book was published by Harper-Collins and was an immediate success. It was translated and reprinted in a number of languages including Spanish, Portuguese and Japanese. To date it has sold over two million copies in paperback. A revised and updated edition of the book is now available from Amazon in Kindle ebook format. Click here to purchase. Below are just a few of the many favourable reviews this book has received since it was published. 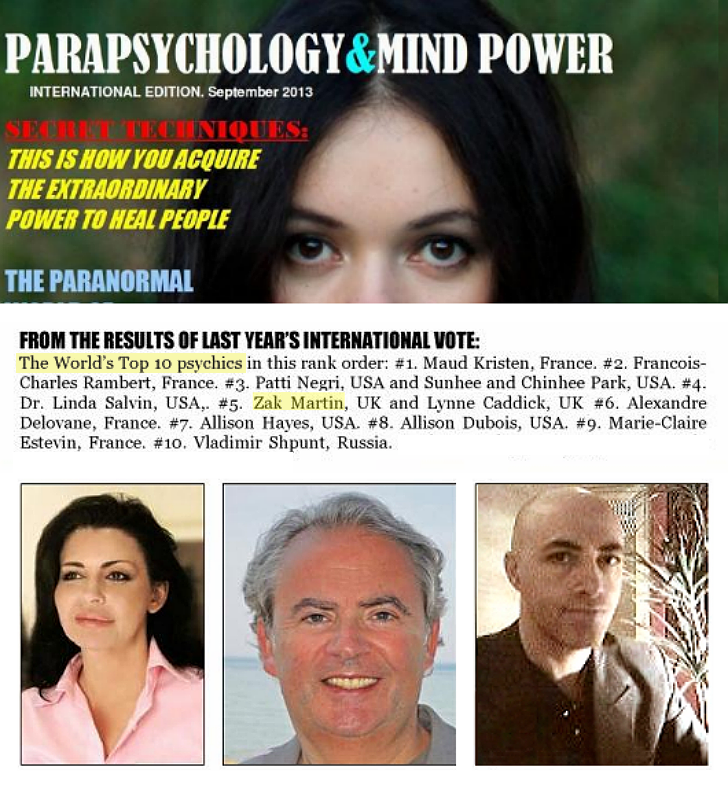 "Many books can teach you to develop latent psychic powers, but this is one of the best I have read. Lucid explanations, sensible suggestions and clear instructions make it a must for any beginner. Recommended." Zak Martin interviewed by Hot Press. 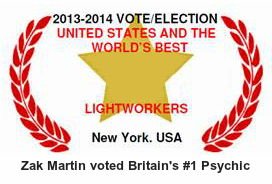 News of the World article about Zak Martin's psychic detection work. Excerpt from Psychic Counselling, by Liz Hodgkinson.. Basic advice on how to boost your ESP by Zak Martin. A brief introduction to the subject of remote viewing. Report on demonstration by Zak Martin of psychokinesis. Article about Zak Martin's profiling work (Portuguese). "Without Zak's penetrating insight on my behalf, I would never have become a professional author. Ever since his vision of my future career, I have written over 100 books, sold and translated in many countries worldwide." - Sasha Fenton, television personality and best-selling author. "Dear Zak, It was a pleasure to meet and work with you... Thank you for the great advice which I promise you I will follow." Marje Proops, OBE, Britain's foremost "agony aunt", journalist and author. Photo courtesy The Mirror, UK. The movie - and subsequently a major TV series - "The Dead Zone" (adapted from the book by Stephen King) dealt with events corresponding closely to events that Zak Martin had encountered in his own life and psychic detection work, and he was consulted in the movie's authentication and promotion. Receive email alerts of Zak Martin's latest articles from EzineArticles.com.